Background: Currently, used oral antiplatelet drugs are both limited and associated with the risk of treatment failure/resistance. Research in this area is hence highly desired. A series of xanthene-3-ones derivatives, we had synthesized, showed us that these derivatives had antiplatelet activity. As far as we know, no research on the effects of xanthen-3-ones in this area has been done. 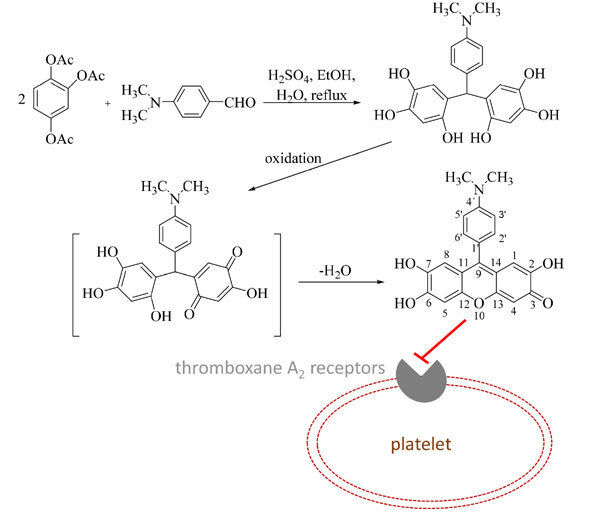 Objective: The aim was to study the antiplatelet potential of a series of synthesised 9-phenylxanthene- 3-ones and to find the ideal structural feature(s) for antiplatelet potential and determine the mechanism of action. Methods: The compounds were synthesized from 1,2,4-triacetoxybenzene and various benzaldehydes. The reaction proceeded smoothly under acidic alcoholic conditions, furnishing the desired products in good yields. The compounds were first screened in whole human blood where platelet aggregation was induced by arachidonic acid. Further analysis was targeted at search of the mechanism of action. Results: Initial screening showed that a majority of the synthesized derivatives had substantial antiplatelet potential. None of the compounds were able to block cyclooxygenase 1 or thromboxane synthase. The mechanism appeared to be based on antagonism of thromboxane effects. The most potent compound 9-(4'-dimethylaminophenyl)-2,6,7-trihydroxy-xanthene-3-one had better potential to block collagen induced platelet aggregation than clinically used acetylsalicylic acid. Conclusion: The last mentioned derivative is promising for further in vivo testing. Antiplatelet, arachidonic acid, cyclooxygenase, platelet, thromboxane, xanthene-3-one.